Can You Innovate Yourself Out of the Game? By now, you all know that I like to write about Apple from time to time. And why not? They are by far one of the most innovative companies of our time. But today, they bring up a different kind of question. Well this question should actually be worded slightly differently. They are not necessarily innovating themselves out of the game. But they are cutting sales of one of their core products to sell another. The story here is this, the introduction of the new generation iPhones, and their popularity, have significantly impacted sales for new versions of the iPod. Why? Well it’s quite simple. Apple fans are buying the iPhone and using it for music. These same people who would be the first to buy the new iPod nano don’t necessarily need it anymore. Sales projections for the new line are way down from the numbers they had achieved last year with the nano model. Obviously Apple is pushing the phones, and that is a business model that they see carrying them forward as a company. There are a lot of things that still need to be worked out as far as the iPhone goes and it seems that more of the company’s resources are being pushed in that direction. So what about the iPod? Apple’s revolutionary semi-core product for so many years is seemingly fading. 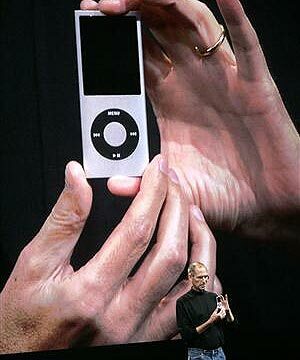 And as iPhones get better and handle more, the iPod may be a part of the past. Should companies be careful about innovating if there is a chance they will hurt themselves in the long run? Well, the answer isn’t quite as simple as yes or no. Apple is under the impression that in the long term, concentrating on the iPhone is the best option, even if it kills the iPod. In a similar position, other companies might hold off for awhile. But overall, if innovating can bring you to the next level and expand business models, it should lead to more growth opportunities than clinging to old products. This entry was posted on Thursday, September 11th, 2008 at 10:21 am and is filed under Risk, Theory. You can follow any responses to this entry through the RSS 2.0 feed. You can leave a response, or trackback from your own site. 2 Responses to Can You Innovate Yourself Out of the Game? He who invents the ultimate long life battery will be king.